TIME Tokyo bureau chief Tim Larimer speaks with Satoshi Tajiri, the quiet, complex man who created a video game in which no one dies--and who in the process launched the worldwide phenomenon known as Pokémon. In this extended interview, Tajiri explains, among other things, the logical trajectory from bugs to Pikachu. 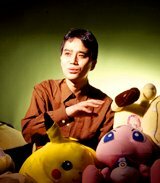 After first coming up with the idea for Pokémon in 1990, Satoshi Tajiri labored for nearly six years over the original game. Now 34, he based it partly on things he remembered as a kid. The careful attention paid off. Pokémon swept Japan and is now doing the same in the U.S. and beyond. Spinoffs include trading cards as closely held as stock options, a TV series and, now, a movie. A person who usually shuns the limelight, Tajiri talked about his labor of love with Larimer and TIME intern Takashi Yokota at the offices of his small company, Game Freak, in Tokyo's Setagaya neighborhood, a youth-culture hub with several colleges and universities. His company occupies two floors in a nondescript office building. Sandwiched between the Game Freak floors is a "cram school" for junior high school students who are taking extra paid-for lessons in hopes of improving their next entrance exam scores. Tajiri had just finished work on the new series of Pokémon games for Nintendo's Game Boy, to be released in Japan Nov. 20. He looked tired. His eyes were bloodshot, there were dark circles under his eyes and his hands and lips trembled while he spoke. He looked like he needed a good long sleep. TIME: Are you O.K.? You look pretty tired. Tajiri: It's the way I work. I sleep 12 hours and then work 24 hours. I've worked those irregular hours for the past three years. It's better to stay up day and night to come up with ideas. I usually get inspiration for game designing by working this schedule. TIME: How did you get started designing games? Tajiri: I'm part of the first generation who grew up with manga [comics] and anime [animation], you know, after 'Godzilla.' I was absorbed with Ultraman on TV and in manga. The profession of game designer was created really recently. If it didn't exist, I'd probably be making anime. TIME: Do anime and games require a similar creativity? Tajiri: The technology in making games and in making anime is really similar. There are common concepts. TIME: We heard you were a Space Invaders junkie. Tajiri: I was really into Space Invaders in about 1978. It got me more and more interested in video games. There wasn't any media to get information about games, so I came up with Game Freak magazine. TIME: Weren't you just a teenager? Tajiri: Yeah. It was handwritten. I stapled the pages together. It had techniques on how to win games, secret tips for games like Donkey Kong. TIME: Did you sell it? Tajiri: The biggest sales were for a special issue on the Zabius game. We sold 10,000 copies. It cost 300 yen each. So when I was 18 I already had a business going. At first I used a photocopy machine--more important than style was selling information. But when sales increased, it was difficult to do it by hand. So I took it to a printer. TIME: How did you move from publishing to designing games? Tajiri: Pretty soon I had some contributors, and we'd all get together and talk about games. The more I learned about games, the more frustrated I became because the games weren't very good. I could tell a good game from a bad game. My conclusion was: let's make our own games. TIME: What were you like as a kid? Tajiri: The place where I grew up [in Machida, a western Tokyo suburb] was still rural back then. There were rice paddies, rivers, forests. It was full of nature. Then development started taking place, and as it grew, all the insects were driven away. I was really interested in collecting insects. [Later, Tajiri's father tells me the other kids used to call Satoshi "Dr. Bug" as a child.] Every year they would cut down trees and the population of insects would decrease. The change was so dramatic. A fishing pond would become an arcade center. Tajiri: They fascinated me. For one thing, they kind of moved funny. They were odd. Every time I found a new insect, it was mysterious to me. And the more I searched for insects, the more I found. If I put my hand in the river, I would get a crayfish. If there was a stick over a hole, it would create an air bubble and I'd find insects there. I usually took them home. As I gathered more and more, I'd learn about them, like how some would feed on one another. So I stopped bringing them home. But I liked coming up with new ideas. Like how to catch beetles. In Japan, a lot of kids like to go out and catch beetles by putting honey on a piece of tree bark. My idea was to put a stone under a tree, because they slept during the day and like sleeping under stones. So in the morning I'd go pick up the stone and find them. Tiny discoveries like that made me excited. TIME: Did you have friends who collected insects? Tajiri: Usually all the kids did it the same way, with the honey. None of my friends would do what I did. I got more insects than anyone. TIME: So you were collecting Pokémon a long time ago! Did you make the insects fight against each other? Tajiri: No, but sometimes they would eat each other. TIME: Did you get the idea for Pokémon from these insects? Tajiri: Yes. Places to catch insects are rare because of urbanization. Kids play inside their homes now, and a lot had forgotten about catching insects. So had I. When I was making games, something clicked and I decided to make a game with that concept. Everything I did as a kid is kind of rolled into one--that's what Pokémon is. Playing video games, watching TV, Ultraman with his capsule monsters--they all became ingredients for the game. TIME: Why did it take so long to finish the game? Tajiri: Well, the first game I did all by myself. That was before Pokémon. I didn't rely on other companies or programmers. I just started by taking apart the Nintendo system to see how it worked. When I was 16, I won a contest Sega was sponsoring for a game idea. It took me two years to learn the programming, and a year to make my first game [called Quinty]. TIME: How did you get hooked up with Nintendo? Tajiri: I saw Game Boy when it was first released. The idea for Pokémon clicked in my mind. The basic idea for Pokémon seemed a good fit for Game Boy. TIME: Why did Game Boy seem right for Pokémon? Tajiri: The communication aspect of Game Boy. It was a profound image to me. It has a communication cable. In Tetris, its first game, the cable transmitted information about moving blocks. That cable really got me interested. I thought of actual living organisms moving back and forth across the cable. TIME: Wasn't the cable being used for players to compete with each other? In Pokémon, players are sharing, too, aren't they? Tajiri: Yeah, everyone was using it to compete. The idea I had was for information to go back and forth. It wasn't about competition. Even before Game Boy, there was a communication capability at game arcades--like two race car drivers sitting next to each other to compete. That's all anyone was doing, using it to compete. TIME: But if you're not competing, games aren't all that much fun, are they? Tajiri: I liked competition too. But I wanted to design a game that involved interactive communication. Remember, there was no Internet then. The concept of the communication cable is really Japanese: one-on-one. It's like karate--two players compete, they bow to each other. It's the Japanese concept of respect. TIME: Like the ritualistic elements of sumo? Tajiri: A more casual form of sumo. Over the Internet, communication can be directed to anyone in the world and it's anonymous. But with a communication cable, it's one-on-one and the players pick who they play against. It doesn't really get aggressive. It's an intricate style of communication. Almost subtle. TIME: How does that translate to the U.S.? Tajiri: It's interesting, because in Japan, everybody goes for Pikachu. In the U.S., the characters Ash [Satoshi in Japan] and Pikachu are grouped together. American kids seem to like that. In America there are more products sold with Ash and Pikachu together, not just Pikachu alone. I think Americans actually understand the concept of Pokémon better than the Japanese. The Japanese focus on Pikachu, but what I think is important is the human aspect--you need Ash. TIME: Pikachu is sort of marginal in the game. But it's now the best-known character. How'd that happen? Tajiri: When they did the anime, they wanted a specific character to focus on. Pikachu was relatively popular compared with the others and potentially both boys and girls would like it. They heard a lot of opinions about this. It wasn't my idea. TIME: Do you think the TV show now dictates how people play the game? Tajiri: At first, I was a little concerned. It depends on how people are introduced to Pokémon. If they start with the TV show, or with the cards, or the video game, they approach it differently each time.